A few years ago I put together a set in the studio that was a surprise success and had become one of the most requested shooting areas in the studio by a certain type of model. I dubbed it Das Fetisch Klinik. The centerpieces being the amazing paneled doors and cabinets walls on the 3rd floor with a stark and clinical (get it?) exam table in the center. I am pleased to announce a brand new session which will have some astonishing set pieces. This will be called The Fetish Cage. Some reading this may recall the Steam Punk sessions in the studio that featured the amazing metal art of Matthew Day of Dark Days Welding. A point finally came where I shared with him some photos I’d collected and asked the question “what would it take to build something like this?” Given his twisted mind it didn’t take long before a commission was born. We spoke and met several times during the planning stages. 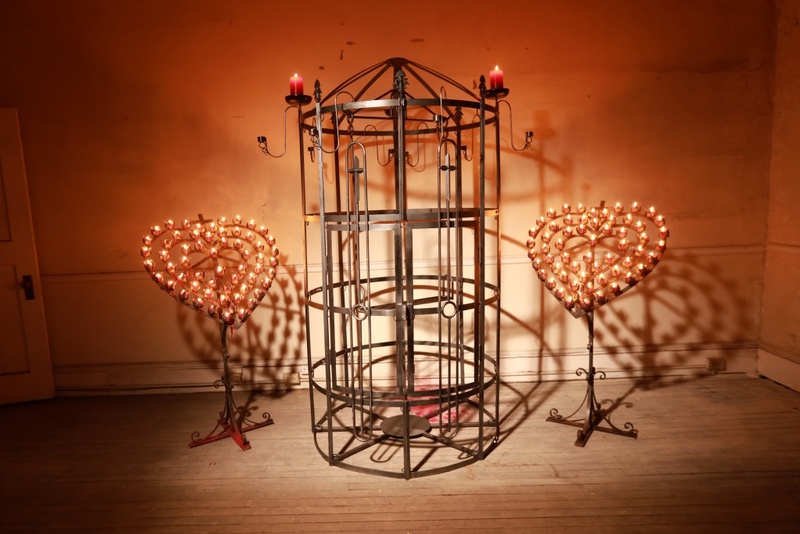 I had a number of elements I wanted the cage to have for the photoshoots. 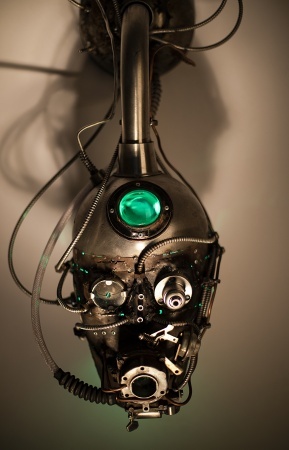 I also left him take over past that to wield (which has the word weld in it) his imagination freely. In a strange twist of fate another set piece crossed my path that I found simply too arresting to pass up. Rather I should put it this way, I decided to rent them for a time. By way of buying them fully knowing I will have to sell them given their value. What are they? Well they happen to be 2 church candelabras. But there are a few things about them that make them very unique and special apart from their obvious beauty. First the shape. They form hearts with crosses at the top. Each holds 60 votive candles. 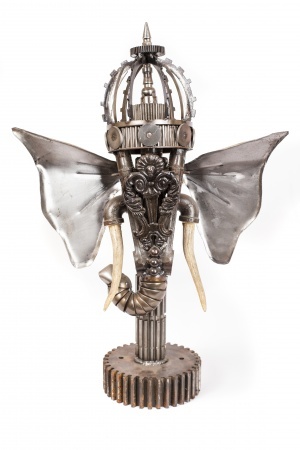 They are large and free standing made of wrought iron that has a wonderful natural patina from their age. The other thing about them is their place of origin. I’m not talking about where they were made, but where they came from. you see they were saved from among pieces taken from the church on the hill in Centralia PA. One of the few standing buildings that remain there. Technically I will offer them for sale as “The church candelabras from the real Silent Hill”. If you haven’t seen the movie Silent hill this won’t make much sense, if you have, it will. The setting for the film was inspired by Centralia and there are some coincidental elements about the church depicted in the movie and the one in Centralia. I have some photos here for reference. 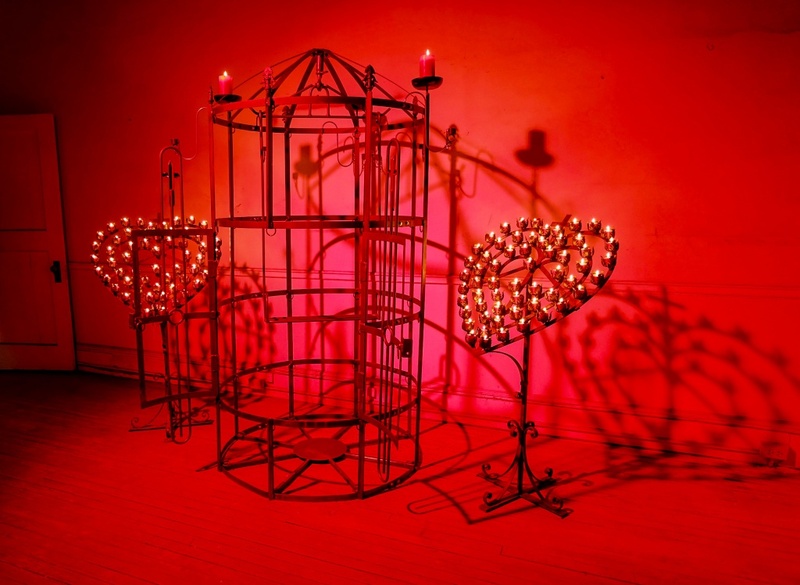 In total between the cage and candelabras there will be easily $3000 worth of set pieces for these sessions. I will not have this set indefinitely. Once we have photos of the cage it will be offered for sale. The candelabras I will try in earnest to sell in a few months time. So what does that mean? Don’t wait if you’d like a session with all these pieces. These sessions will begin at $250 for the shoot with 4 edits of your choice, to your specifications. MUAH is additional if needed. It’s on the deposit form now. 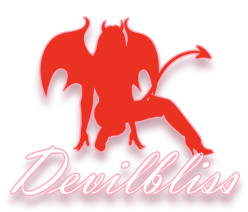 Message me on the Devilbliss FB page to find an available date for your session.